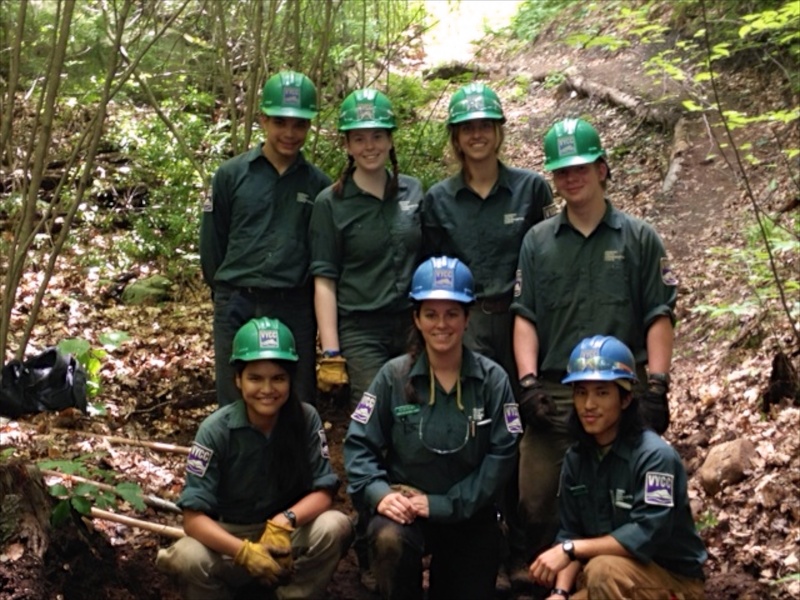 A huge thanks to local volunteers and the Vermont Youth Conservation Corps (VYCC) for the many trail improvements accomplished in June and July. On June 15. a small, but dedicated team of volunteers worked hard to clear stumps that had come up in the new section of trail . They also improved drainage from the bridge up to the Fox Farm Road right-of-way. Thanks to Jason Cooper and Diana and Hank Lange. From June 30-July 11, 2014, the VYCC crew completed many projects and did a terrific job while here for 2 weeks . They replaced two drainage culverts on the trail adjacent to the Riverstone Preserve, which stood up very well to the torrential downpour we had a few days later. The crew was very happy to get to see how the work they did on the culverts would perform in such an extreme condition. They also cleared a lot of the knotweed from the bank of the river, completed a new section of trail on the Riverstone Preserve that includes a 30′ raised walk over a chronically wet section and demolished an old shed that was falling down. Thanks so much to the VYCC crew for doing an excellent job to improve the West River Trail. Thanks to Jason Cooper for the work reports and for all his good work to improve the lower section of the West River Trail. Take a run, walk or ride on the trail soon and check out all the improvements! This entry was posted in lower section, west river trail and tagged lower section, volunteer workday, west river trail, west river trail improvements. Bookmark the permalink.